MANILA, Philippines - PAGASA issued the latest weather update on Tropical Storm Vinta or Bagyong Vinta, 2:00 PM, December 22, 2017 (Friday). Tropical Cyclone Warning Signal No. 2 are still raised by PAGASA in seven (7) areas and Signal No. 1 in eighteen (18) areas. As per the administration's latest update, the Tropical Storm has further weakened and is now moving towards the Misamis Occidental and Zamboanga del Norte area. 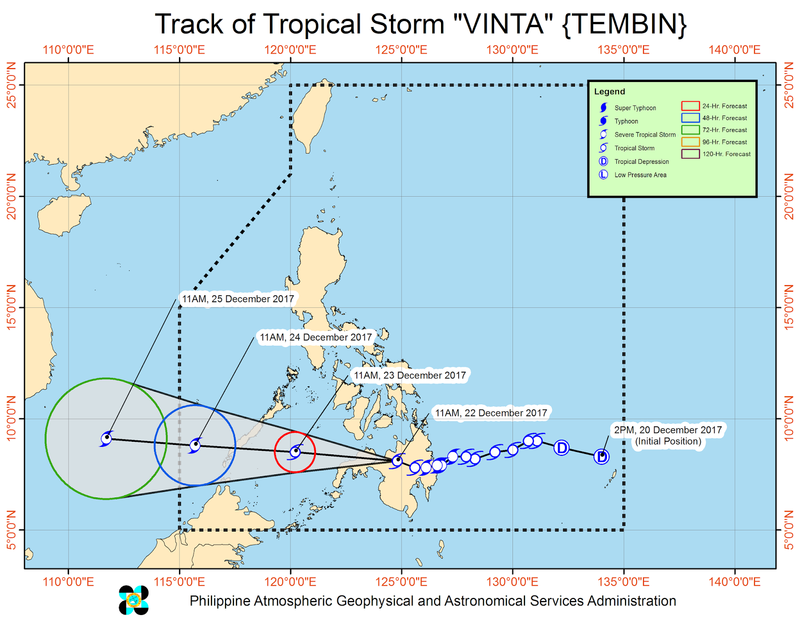 At 1:00 PM today, the center of Tropical Storm "VINTA" was estimated based on all available data in the vicinity of Marawi City, Lanao del Sur. Maximum sustained winds of 65 kph near the center and gustiness of up to 110 kph. Likewise, it is expected to move west at 20 kph. PAGASA warned of scattered to widespread moderate to occasionally heavy rains over Visayas and Western Mindanao within 24 hours. Residents of the affected areas must make appropriate actions against flooding and landslides, coordinate with their respective local disaster risk reduction and management offices, and continue monitoring for updates. Below is the forecast movement and track of 'Vinta' in the next 24h, 48h and 72h, image(s) courtesy of PAGASA. Meanwhile, sea travel remains risky over the seaboards of areas under Tropical Cyclone Warning Signal (TCWS). To receive up-to-date news about PAGASA weather updates, we advise our visitors to visit their official website, bookmark this page or follow us at our social media pages via Facebook and Twitter.